Sometimes a person buys a share in a business in order to contribute to the business, help run it, take a salary perhaps, or share in the profits, but not necessarily to sell the ownership in a few years. That’s not angel investment. And when your rich aunt gives you $25,000 to start a business, that’s friends and family investment if she then owns a share of your company; and generosity and family spirit if she doesn’t. You don’t pay investors back. You make your business worth more so they can sell their shares to somebody else to get a return, at exit. There are books for angel investors, books about angel investors, and books about how to secure angel investment. There are also several well-known angel investment platforms. The website at gust.com is a platform for angel investors and entrepreneurs to share information, and it has a wealth of information about angels, in videos and articles. The Angel Capital Association (http://www.angelcapitalassociation.org/) has directories, definitions, lists, and explanations. You can also check out AngelList and do a web search for “angel investors.” This chapter is a short summary. I’m including it because I’ve had a lot of experience with this topic, and it relates well to lean business planning. Angel investors generally focus on seed money – early investment for startups at early stages of growth – for amounts less than $1 million. Several experts have different definitions of angel investment, on how many angel investors exist, and how much money they invest. As I write this in 2015, the latest available statistics come from 2013. 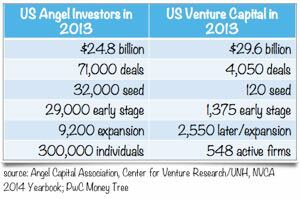 Approximately 300,000 angel investors did 71,000 deals with startups, mostly for seed financing and early stages. OR has a net worth over $1 million, either alone or together with a spouse (excluding the value of the person’s primary residence). Those rules were going to relax with the Jobs Act of 2012, which people would open the gate to crowdfunding, but hasn’t yet (see below, on crowdfunding). Startups looking for investment are still going to angel investors pretty much the same way they have for several decades. And angel investors are still mostly wealthy individuals, often with tech industry background, often former entrepreneurs whose former endeavors succeeded. There are listings of angel investors on the web, and gust.com lists more than 600 groups of angel investors operating in the United States and elsewhere. First, I see this confusion a lot: People use the terms venture capital, venture capitalist, and VC to apply to any outsider investing in a startup. However, it’s useful to draw some distinctions in this area, between three important classifications: venture capital, angel investors, and anybody else. Venture capital means big-money investment managed by professional investors spending other people’s money. The money comes from extremely wealthy people, insurance companies, university endowments, big corporations, etc. Think of Kleinert Perkins et al., First Round, Softbank, Oak, etc. Venture capital usually comes in millions of dollars. Over the last few years, Venture Capital has moved towards larger investments for companies further along the business growth cycle, and away from smaller investments for true startups. Is Your Business a Candidate for Angel Investment? Attractive potential growth in sales. Think of big growth, like from zero to $5 million annually, or even better, $10 or $20 million annually, in three to five years. Nobody can predict the future, but angel investors pride themselves on being able to make good guesses. From the entrepreneur’s side of the table, that means having a credible growth story. Numbers aren’t enough. Anybody can type numbers into a spreadsheet. You need a story, along the lines I included earlier in Lead with Stories and Stories as Strategy. Angel investors will read your story and build their own guess about the company’s potential. At that point, the numbers (market analysis, demographics, research) are useful if the story rings true. I also referred to this idea in Stories Matter More Than Numbers. You need to be able to grow with scale. That means your business can increase its unit sales very fast without having a proportionate increase in fixed costs, head count and marketing expenses. Most product businesses can scale larger by adding capacity to a product manufacturing process in a relatively easy fashion. Most web businesses can grow easily since it’s relatively simple to add proper bandwidth when increasing the number of users of a website or application. But service businesses often suffer the problem of needing to increase personnel to grow. Investors call it a body shop when doubling sales is possible only by doubling the fixed costs and numbers of employees; and that’s not a good thing. Sometimes service businesses will try to generate scale with franchising. But franchising isn’t credible option for angel investors until you have a very successful working first venue (or two or three). You need to have some way to ward off or delay competition. Investors talk about a so-called secret sauce, or technology, patents, trade secret, or some way to erect barriers to entry. The worry is that a well-funded big company will jump in on a new business, outspend it and take away its opportunity. People talk of the so-called first mover advantage that makes an idea defensible if the initial entrant to the market grows fast and builds its customer base very quickly. That works sometimes, but not always. Investors will use their own judgment in reviewing the idea, not necessarily what you tell them. You need a credible management team. Angel investors are not likely to invest in a startup that doesn’t have at least one founder who has already been involved in a startup. This is disappointing to first-time entrepreneurs, but the fact is that in startups, nothing substitutes for experience. First of all, there is no normal. Angel investors are individuals, investing their own money. Many join groups that will invite startups to pitch for the group; but many operate as individuals. So what I say here is what’s common, what I’m familiar with, and what usually happens. It starts with an introduction. The easiest version of the introduction is a formal submission to an angel investment group, using one of the angel platforms like gust.com or AngelList. Otherwise you ask for an introduction from somebody you know who might know angel investors: maybe a business school professor, or somebody from a local chamber of commerce. Or perhaps you attend a business event. Unsolicited emails to angel investors rarely work, but aren’t impossible. If you’re talking to a potential angel investor, keep your elevator speech (Chapter 14) in mind, and if the occasion fits, use it. The angel investors will look at your summaries – a summary memo sent via email, perhaps, or a business summary submitted on one of the platforms. This is what I cover in Chapter 12. If the summary catches their attention, and they like what they see there, you’ll be invited to do a business pitch. This is what I cover in Chapter 13. If they hear the pitch, ask questions, get some answers, and are still interested, then they’ll want to see your business plan. That usually means a formal business plan document, as in Chapter 15. However, times are changing, and many angel investors will settle for just the lean business plan after they’ve met you, talked with you, and heard your business pitch. Some kind of business plan is necessary because they want to dig into your business as part of the due diligence every conscientious investor does before making the investment. Due diligence is a serious process that takes weeks at least, and often months. Investors need to check lots of details including legal details, contracts, deals with suppliers and distributors, important customers, technology, patents, and other things. It’s extremely rare to go from introduction to depositing a check in a matter of weeks. The term crowdfunding, when experts started using it, referred to the idea of large numbers of people investing relatively small amounts each to fund startups. It was about investing, buying shares in a startup. Over the last couple of years it’s come to refer to a wider range of possibilities, such as individuals lending money to startups (often called micro lending) and individuals pre-paying startups to pre-purchase goods or services before they are available. The most successful of the pre-purchase platforms is Kickstarter. With Kickstarter, you and I can fund a startup by promising to buy its good when they are finally available. A startup building a high-tech watch received more than $8 million in pre-purchases. I’ve bought several items over Kickstarter. My purchases were managed by amazon.com, which took my order and credit card information. The entrepreneurs building the tech devices had assurance of eventual purchases. When the devices were shipped, my credit card was charged. Many entrepreneurs rejoiced in April of 2012 when President Barack Obama signed the 2012 JOBS act, which many thought would relax the SEC rules related to angel investment and open the door to so-called crowdfunding, allowing startups to take investment money from people who aren’t accredited investors. The common vision was of startups raising hundreds of thousands of dollars in investment from thousands of people. That hasn’t happened. SEC rules have tightened. Startups have to deal with strict regulations controlling how they solicit investment funds, and from whom. I’m not going to go into legal details in this book, but please be aware that for practical purposes it takes an experienced attorney up to date on angel investment to guide you through the legal maze. Meanwhile, states have been moving on crowdfunding, with state laws, rules, and regulations that allow individuals who aren’t accredited investors according to SEC definitions to invest in startups. In Oregon, for example – where I live – startups can take up to $250,000 investment from unaccredited investors, not to exceed $2,500 from any one unaccredited investor. As this is written, in early 2015, 15 states have opened up the possibility of crowdfunding. Limitations go up to no more than $2 million total funding through crowdfunding, with limitations up to $10,000 per individual unaccredited investor. Some of these programs are still at proposal level, and some are already available.